Emory pathologist Sharon Weiss, MD, was the first to describe an extraordinarily rare tumor known as an epithelioid hemangioendothelioma (EHE). Thirty years later, researchers have identified a genetic alteration linked to this odd vascular tumor. Itâ€™s hoped this newfound information will lead to a better understanding of the mechanisms underlying the development of this tumor and hence development of a targeted treatment. None yet is available. However, these findings already have been used to develop a new diagnostic test for this blood vessel disease. The research, published in a recent issue of Science Translational Medicine, was done in collaboration with Cleveland Clinic’s Taussig Cancer Institute and led by Brian Rubin, MD, PhD, of Cleveland Clinic’s Pathology and Laboratory Medicine Institute and Lerner Research Institute. The genetic alteration formerly in question involves a translocation between chromosomes 1 and 3, where chromosomes 1 and 3 exchange DNA fragments that are transposed onto opposite chromosomes. The result: the swapped DNA encodes a unique, fused gene that contains components from each chromosome. Because genes are translated into proteins, the result of this unique gene is a correspondingly unique protein, one thought to cause cancer. 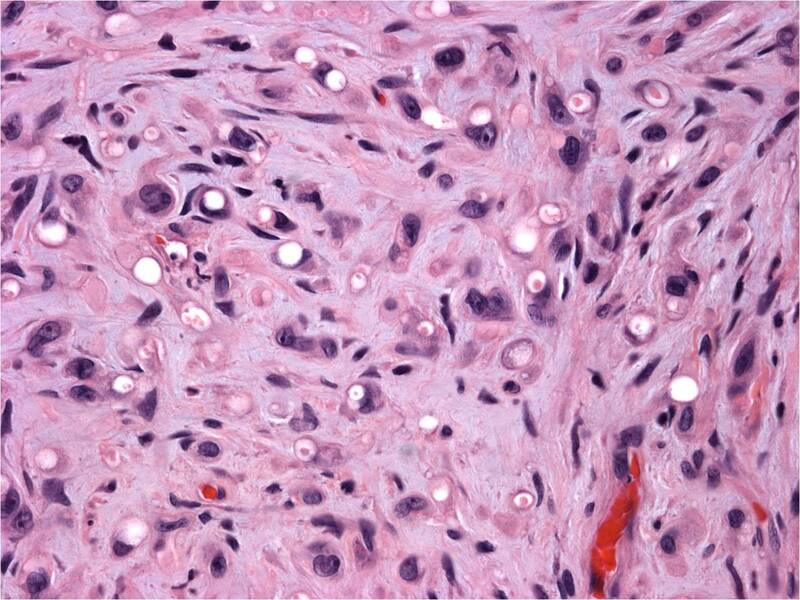 Epithelioid hemangioendotheliomas comprise less than one percent of all cancers. Roughly 100 new cases are diagnosed in the United State each year. EHE are eccentric in their epidemiology, structure and aggressiveness. Slow to metastasize, they tend to occur in both young men and women when soft tissue is involved but occur mostly in women when the liver and lungs are affected. However, itâ€™s their peculiar structure that has so far made targeted treatment problematic, especially in the liver and lungs. â€œInstead of being one mass as you might expect with liver cancer, the patient with EHE often presents with little nodules throughout the liver,â€ says Weiss. Using EHE tissue samples gleaned from Weissâ€™s vast library, Rubin developed a genetic probe to detect the distinct chromosomal translocations in the tumor. 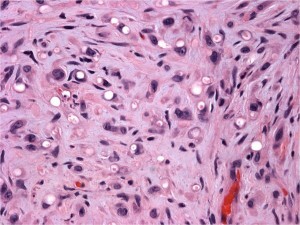 The probe now serves as a powerful diagnostic tool of EHE and opens the door to understanding these tumorsâ€™ mechanisms. â€œOnce you understand the mechanism behind it, you can start trying to target those pathways in a therapeutic way,â€ says Weiss.